Hilda Sanchez, a U of A student in the Master of Arts in Teaching program, is pictured with one of the children she tutored. Natalie Holliman is a math specialist in a Little Rock middle school. She knew she wanted to provide her children with an educational experience to boost their reading skills this summer. So, she turned it into an adventure, bringing Taylor and Tyler to stay at an Airbnb in Fayetteville for two weeks so they could attend reading camp offered by the University of Arkansas Clinic for Literacy. 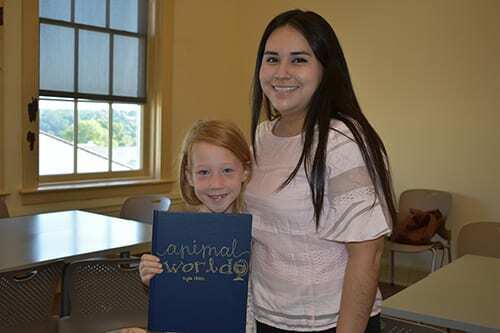 Linda Eilers, clinical associate professor of childhood education, and Heather Young, assistant professor who coordinates the childhood and elementary education programs, established the Clinic for Literacy in Peabody Hall in 2016. Each semester, U of A students taking literacy courses learn about the science of reading and the various difficulties children face in learning to read. Under faculty supervision, the U of A students, many of whom are enrolled in the Master of Arts in Teaching program, perform a pre-assessment on each child who attends a session of the reading camp. They help design a curriculum and work one-on-one with children throughout the camp. At the end of camp, the U of A student meets with the parents of the child to go over what the child learned, the progress made and activities that the family can continue to do at home. “The goal is to teach students strategies to align with what they are already learning in school and that can be transferred to other areas of achievement,” Eilers said. Holliman found the camp information on the College of Education and Health Professions website through a google search. There was a literacy-tutoring program offered by an institution closer to home for her, but it met less frequently and included an online component that did not interest her. Additionally, the one-on-one component became most appealing given the benefits this educator-parent knew from her past experiences of educating students in mathematics in classroom versus tutoring frameworks and environments, she said. Tyler, who started third grade this fall, does well in reading but Holliman felt her younger son, Taylor, who started second grade, could benefit from some extra instruction. She described the U of A literacy program as providing much more than she expected. Holliman said she appreciated the detailed report she received in the conference on the last day of the program. She found that the U of A students cared about doing their best with the children and that the children responded well to the attention from graduate students. The fall literacy camp will feature children’s author Jack Gantos, creator of the Jack Henry, Rotten Ralph and Joey Pigza series and author of many other books. The camp will take place from 9 to 11 a.m. on four Saturdays – Sept. 8, Sept. 29, Oct. 13 and Nov. 3 – in Peabody Hall. Registration is $49.99 per child. The camp will focus on Gantos and his works, which have won the several national awards, and include a visit by the author. For more information, email litcamp@uark.edu.